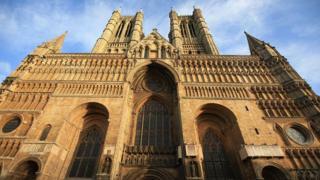 Lincoln Cathedral has been named the country's favourite in a Twitter poll called the Cathedral World Cup. More than 27,000 votes were cast in the final round of the lighthearted contest, set up by architecture fan Ben Brock (@cinemashoebox) last month. Lincoln was neck-and-neck with York Minster but narrowly pushed into first place on Saturday morning. Bristol and Durham cathedrals were also runners-up. It was supported by ex-pop star the Rev Richard Coles, who was ordained there. He tweeted: "Now look here, Twitter: Lincoln Cathedral - where it just so happens I was ordained - is the best building in the world. YOU KNOW THIS. #cathedralworldcup"
Lincoln Cathedral tweeted it was "a pleasure" to win and urged people to visit their local cathedral. Mr Brock, 27, tweeted his "immense respect" for the cathedrals and fans that took part in the poll. He also urged people to go and visit some of the buildings. "They are centuries-old crystallisations of community and labour and art and the beliefs and ideas of thousands of people, and they're incredibly precious." Speaking to BBC News he said: "I'm an architecture nerd, and I'd been reading up on various cathedrals and am always looking for ways to shout about architecture on Twitter. "On a whim I checked how many there were and it turns out England and Wales has 48 (Anglican, that is), which is a good number for the world cup format that Twitter does so well - so it sort of suggested itself to me." He said the support the contest had received had been "bizarre but wonderful". "I thought it wouldn't really go beyond my immediate circles, but one or two of the cathedrals and a journalist picked it up and off it went." He said Twitter does not make the exact breakdown of votes known, but that Lincoln and York each got 33%, Durham 26% and Bristol 8%. He said Lincoln must have received slightly more votes but the result was very close. York Minster tweeted: "Congratulations to not only winners @LincsCathedral but to every Cathedral who took part in this. "It's been a pleasure and we've had a lot of fun discovering more of the incredible work Cathedrals do. #GodBless"